My recreation of an F3 crossing Donner Pass on the Southern Pacific in 1953. June 13 2008 - Why is Model Railroading a cool hobby? I have had many different hobbies over the years. For a number of years I built R/C model planes and flew them at the local field and built R/C model gliders to soar off of the cliffs over the ocean. I built combat robots. These aren�t really robots but armored RC trucks with a weapon. I went to a few competitions but soon got bored with it. I built a 16 foot wooden sailing boat. I�ve built computers from scratch and stereo amplifiers. I have built Hi-Fi speakers - I still have a giant subwoofer I built that really adds a lot of punch to surround sound movies. I have two synergistic hobbies that I keep coming back to, model railroading and photography. One nice thing about model railroading is that it combines my interests in model building, electronics and photography all in one. 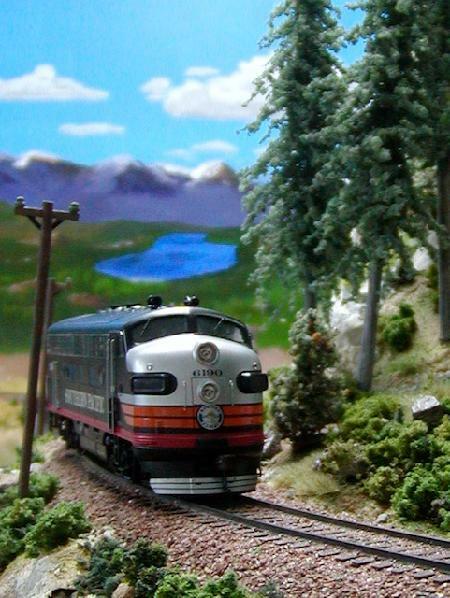 Model Railroading is a complex hobby with many aspects. At different times I have been able to emphasize different facets of the hobby to keep my interest going. To me, the one downside to the hobby is the lack of understanding on many people�s part of what the hobby is about. Chief among these is that model railroaders are just little boys running trains. It is funny how some hobbies, such as painting, quilting, photography, mountain climbing, racing cars, are considered respectable adult activities and some are considered leftovers from childhood, such as running trains. When you tell people you have a model railroad you almost always get a tale of Christmas and toy trains or the crazy uncle with a basement full of toy trains. To me model railroading is an art form and I am an artist. I get no respect. Model railroading combines together a lot of diverse skills and techniques to recreate a small piece of history. As a bonus you get to operate the history and watch the trains run. What you see on the this website is the result of several years of active construction following on many years of honing my skills. I am already planning the next bigger and more prototypical next layout.